The use of turbidity sensors is widely prevalent in the sediment community. The common practice is to calibrate the turbidity meter with some ‘representative’ samples and then use this calibration to convert measured turbidity into suspended sediment concentration. Turbidity represents the area concentration of suspended sediment. It follows then that the turbidity is sensitive to V/d, where V is particle volume and d is particle diameter. When a mixture of particle sizes is present the turbidity measurement represents the sum for all sizes: V1/d1 + V2/d2 + V3/d3 + …Per unit concentration, large particles produce a weaker turbidity signal than small particles. This is often erroneously reported as a cut-off in sizes, beyond which turbidity sensors are blind. In reality, their sensitivity decreases inversely as grain size d increases, i.e. as 1/d The data below illustrate this. The data were acquired during tests of the LISST-SL instrument conducted by the USGS at the Cowlitz river bridge in Castle Rock, WA, USA. This instrument employs laser diffraction technology to measure size distribution and concentration. The left panel, optical transmission (equivalent to turbidity), shows an apparently vertically mixed water column over the water depth. The second panel shows velocity, which has a decrease nearer river bed. The third panel shows the concentration, which unlike turbidity now reveals an increasing concentration toward the river bed. Red circles in this panel show data from P-61 physical samples taken by Kurt Spicer (USGS) at the same time, showing a good match. The average concentration increases three-fold toward the bed, again, without any indication in turbidity. The last panel explains why. It shows the particle size distribution with depth. The color bar on right shows concentration. The horizontal axis is grain size in F units (2.5 to 500 µm). It emerges that a vertically constant wash load exists at size F ~6 (16 µm).Coarse particles (at F ~2) do not exist at the surface, but their concentration increases with depth, so much so that it dominates the total concentration at the deepest point. Because these particles are large, turbidity is less sensitive to them and therefore the turbidity signal remains constant throughout.All rivers exhibit such vertical structure – a structure first described by Rouse in 1937. 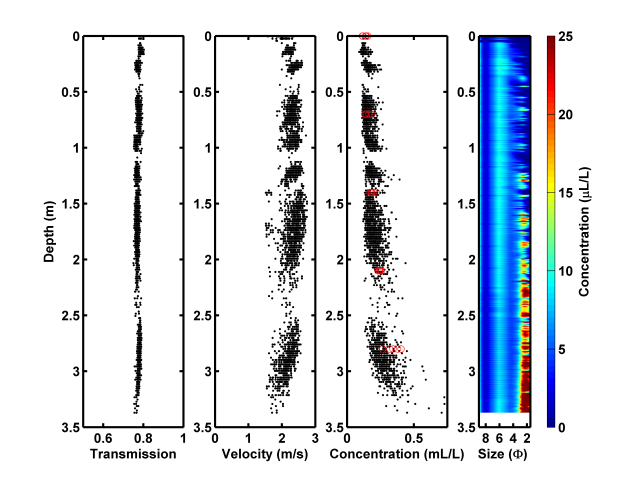 Turbidity sensors do not respond to it, and laser diffraction clearly explains why. Furthermore, in this case turbidity would be interpreted as a vertically constant concentration, whereas in reality, concentration increased 3-fold near the bed. Finally, note the large variations in concentration of a factor of 2-3 at any given depth. This is also not seen in the turbidity profile. Again the particle size distribution explains why: All the variation in concentration at any depth is due to variation in the coarse particle sizes, to which turbidity does not respond. Sign up to get the latest news on Sequoia and our products! Dr. Ole Mikkelsen takes over as President and CEO of Sequoia Scientific., Inc.